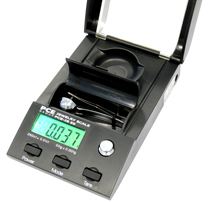 The PCE-JS 50 pocket scale is an accurate scale with a high resolution and a good protection due to its cover and it is ideal for laboratory use or any other purpose where highly accurate readings. are required. 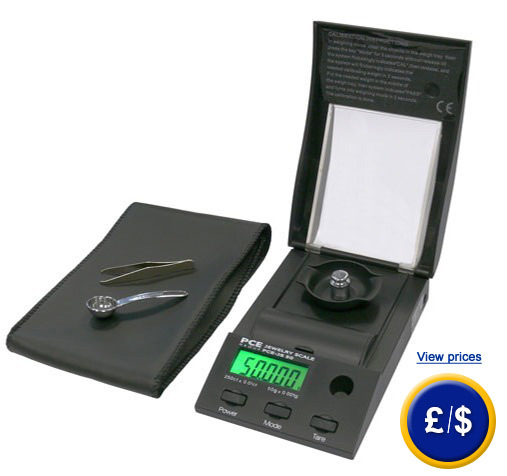 You will not find such an accurate scale with resolution of 0.001 g at such an affordable price as this pocket scale. It is very easy to operate with only three keys located below the green, backlit LCD. A calibration weight is included to test the accuracy of the scale. ISO calibration certificate can be obtained separately. Here is another type of pocket scale that might suit your needs. This link shows an overview of the scales and balances which meet your requirements. - Easy to read LCD. - Tare over the full range can be done during a weighing if required. - Battery low indicator to eliminate erroneous results. - Auto shut-off after 4 minutes of inactivity. - User manual is found in the scale cover. - Protective cover against the wind to ensure accurate readings. - It comes with a spoon and a clamp. - It also comes with a calibration weight, batteries and user manual. - ISO calibration certificate can be ordered separately. The ISO calibration certificate documents the properties of the pocket scale. It ensures that the measurements taken by the pocket scale meet the national standards.